Reasons to build a replica include historic research into shipbuilding, national pride, exposition at a museum or entertainment (e.g., for a TV series), and/or education programs for the unemployed. For example, see the project to build a replica of the Continental brig Andrew Doria. Apart from building a genuine replica of the ship, sometimes the construction materials, tools and methods can also copied from the ships' original era, as is the case with the replica of Batavia in Lelystad and the ship of the line replica Delft in Rotterdam (Delfshaven). The term "replica" in this context does not normally include scale models. The term museum ship is used for an old ship that has been preserved and converted into a museum open to the public. 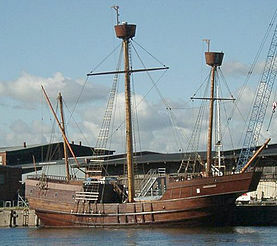 A ship replica may also be a generic replica, one that represents a certain type of ship rather than a particular historic example, like Kamper Kogge, replicating the Cogs that were used extensively in Northern Europe by the Hanseatic League in the Middle Ages, but where there is little knowledge of specific ships. Some generic type replicas such as Thor Heyerdahl's Ra II, qualify as true replicas as these ships were built to investigate the craft and or culture of the original era. That they do not replicate a specific vessel is mainly because no details of such a specific vessel are available. Some other ships that are modeled after ships of a certain type or era (and are in that sense replicas) do not qualify as true replicas. Some ships may be borderline cases, such as Kanrin Maru, which is actually twice the size of the original, but built following the plans of the original. Replicas can be temporary, cheap and very simple, such as the replica of a Viking ship that was burnt at the Leixlip Festival. USS Constitution (1795) is strictly speaking not a replica but the original vessel. However, most of the ship's timber has been replaced over time, with only 10-15% of the original remaining. This is a modern version of the philosopher's dilemma concerning replica versus original; known as the Ship of Theseus dilemma. HMS Victory (1765) is still the original vessel, although unlike Constitution, she is in dry dock and does not sail. She has also been heavily restored, with only 10-15% of her original timber remaining. Mircea, which is an almost exact copy of Gorch Fock. Mircea was built as a copy because Gorch Fock was a very successful ship. Thus Mircea was not built as a replica per se, but as a copy for other reasons (i.e. to perform economically, in this case as a training vessel). Stad Amsterdam is a generic clipper type ship combining the best qualities of clippers of the past with modern materials and technologies. Another ambiguous case subject to the Ship of Theseus dilemma is Niagara. The original was sunk in 1820 for preservation, and the ship has been rebuilt three times since. The third reconstruction was considerably more extensive, and the only parts from the original which were retained are non-structural, leading many authorities to classify her as a replica, rather than a reconstructed original. Uluburun II Merchant Bodrum, Turkey Bodrum Underwater Archaeological Museum Turkey c.14th century BC Late Bronze Age merchant Sank c.1316–1305 BC Oldest known merchant shipwreck. Hugin Viking ship Ramsgate, England Plinthed at Pegwell Bay Denmark 449 Hengist and Horsa land in Kent Rowed across the North Sea to commemorate the 1500th anniversary in 1949. Brendan's currach Currach Craggaunowen, Ireland Ireland 512-530 Legenday voyage across the Atlantic Ocean to America in a small open boat ? Myklebust Ship Viking ship Rundehåjen in Nordfjordeid SAGASTAD – The impressive Science and Experience center in Nordfjordeid, will open in spring 2019. Norway was built in the 800s. Norways biggest Vikingship end of 800 (876?) The building will be built by Eid Industrihus KF with construction start in 2017 in the new Saga park in Nordfjordeid center. Victoria Carrack Seville, Spain Fundacion Nao Victoria Spain c.1515 Only survivor of Magellan's 1519-1522 first circumnavigation of the planet Achieved the circumnavigation of the globe again in 2006. Godspeed Brigantine Jamestown, USA Jamestown Settlement museum United States c.1605 First permanent English settlement in North America, 1607 The 1984/85 replica sailed the Atlantic (without the aid of engines) departing London on April 30, 1985 with a crew of 14. Mayflower II Merchant Plymouth, MA, USA United States c.1607 Pilgrim ship 1620 Dismantled 1623? 1650 Original trading mission into Hudson Bay 1668-69) for precursor of the Hudson's Bay Company Unknown (possibly sunk in the 1670s) Crafted for 1970 tercentenary of HBC. Sailed up and down Atlantic and Pacific coasts of North America. Lenox Ship of the line (70 guns) Proposed for Deptford, London, UK Proposed Deptford Dockyard Museum United Kingdom 1678 Took part in capture of Gibraltar (1704) Scuttled to serve as breakwater in 1756 Proposed (in 2013) full-size sailing replica, to be built in a dedicated museum on the site of old Deptford Dockyard where the original was built. l'Hermione 12-pounder Concorde-class frigate Rochefort, France L'Association Hermione-La Fayette France 1779 Used by Lafayette during the American Revolutionary War Sank 1792 Replica Hermione started sea trials in September 2014; set sail for comemorial voyage on April 18, 2015. Friendship of Salem East Indiaman Salem, Massachusetts USA Salem Maritime National Historic Site United States 1797 Captured in the War of 1812 and condemned as a prize of war. Jewel of Muscat; Omani 9th-century sailing ship built to retrace the route of the original ship from Oman to Singapore. Princess Taiping; a replica of a Ming Dynasty Chinese junk. Hokule'a; Honolulu, Hawaii; an ancient Hawaiian vessel. Makali'i; Kawaihae, Hawaii; an ancient Hawaiian vessel. Alingano Maisu; Kawaihae, Hawaii; an ancient Hawaiian vessel. Hokualakai; Hilo, Hawaii; an ancient Hawaiian vessel. Iosepa; Honolulu, Hawaii; an ancient Hawaiian vessel. Hawaiiloa; Honolulu, Hawaii; an ancient Hawaiian vessel. Te Aurere; Auckland, New Zealand; an ancient Maori vessel. Aotearoa One; Auckland, New Zealand; an ancient Maori vessel. Te Au O Tonga; Rarotonga, Cook Islands; an ancient Polynesian vessel. Takitumu; Rarotonga, Cook Islands; an ancient Polynesian vessel. Tahiti Nui; Tahiti, French Polynesia; an ancient Polynesian vessel, formerly named "Hawaiki Nui". Ictineu II; Barcelona, Spain; a replica of the first mechanically powered steam driven submarine. The Hjortspring Boat is replica of a Danish Iron Age rowing boat. At the Viking Ship Museum in Roskilde, replicas of Viking ships are built. Various projects for building replicas of the ill-fated RMS Titanic have been proposed over the years. The first Titanic replica to actually commence construction is being built by Chinese firm Seven Star Energy Investment, likely to be completed in 2020 (delayed from an original target date of 2017). It will not sail on any ocean, but be permanently docked on a river in Sichuan province to function as the main attraction for the Romandisea Seven Star International Cultural Tourism Resort. Various "replicas" of Noah's Ark have been built. Whether they are properly regarded as "replicas" depends on whether one takes the Biblical flood story as mythology or fact. Since the Biblical description of the vessel is very brief beyond the basic measures, the exact design of any "replica" is necessarily conjectural. ^ "Andrew Doria - The First Salute, Inc". Retrieved 2012-08-18. ^ a b "Het oorspronkelijke schip 'De Delft'" (in Dutch). Historische werf Rotterdams Welvaren. Retrieved 2012-08-18. ^ "FAQ". Collections & History. USS Constitution Museum. Archived from the original on 2011-09-30. Retrieved 2012-08-18. ^ "Interview: HMS Victory's Commanding Officer, Lt Cdr John Scivier". Archived from the original on 12 December 2009. Retrieved 2012-08-18. ^ "Diving into History: Min of the Desert". Archaeology. Retrieved 2017-02-24. ^ "How Hatshepsut Helped Build The Good Ship Min. Min of the Desert takes to the sea". Zenobia: Empress of the East. Retrieved 2017-02-24. ^ "Min of the Desert". ferrebeekeeper. Retrieved 2017-02-24. ^ "Uluburun II Project". 360° Arastirma Grubu. Retrieved 2012-09-20. ^ Starting from Odessa (Ukraine) in 1989, Ivlia followed the routes of the ancient mariners on the Black Sea and the Mediterranean as well as the Atlantic, covering more than 3.000 nautical miles in six expedition seasons and visiting over 50 European ports, finally sailing up the river Seine to reach Paris. ^ "The ship Kybele is ready for travel". Turkish Maritime. Retrieved 2017-02-24. ^ "A Journey into History: İzmir-Phokaia-Marseille". Narkive. Retrieved 2017-02-24. ^ "Historical ship returns to Turkey". Hurriet Daily News. Retrieved 2017-02-24. ^ "A historic deja vu: Phokaians taking civilization to Marseille". Hürriyet. Retrieved 2017-02-24. ^ "Kybele, andar per mare come gli antichi greci". La Republicca. Retrieved 2017-02-24. ^ "Build the Lenox". www.councilmeetings.lewisham.gov.uk. Lewisham Borough Council. 11 July 2013. Retrieved 19 May 2016. ^ "The Lenox Project: a lasting legacy for Deptford". www.buildthelenox.org. The Lenox Project. 3 December 2015. Retrieved 19 May 2016. ^ "Construirán réplicas navegables de la goleta Ancud y del bergantín Beagle" (in Spanish). La Prensa Austral. 31 December 2011. Retrieved 2012-08-18. ^ "Jeanie Johnston Update". Dublin Docklands Development Authority. Retrieved 22 November 2009. ^ "The Guild of the Hjortspring Boat". Archived from the original on 1997-04-08. ^ "Chinese firm Seven Star to build full-size Titanic replica and sink it". BelfastTelegraph.co.uk. Retrieved 8 September 2015. ^ "State-run shipbuilder begins assembling parts for full-scale Titanic replica - Global Times". globaltimes.cn. Retrieved 8 September 2015. ^ "Titanic II or Titanic III". The Maritime Executive. Retrieved 8 September 2015. ^ Williams, Sophie (2017-04-13). "Raising the Titanic: Full-size replica of doomed ship takes shape at Chinese theme park (but owner scraps plans to introduce the 'iceberg experience' amid outcry)". The Telegraph. Retrieved 2017-04-14. Wikimedia Commons has media related to Replicas of ships. The wooden ships company "Varyag"